Instagram is the popular iPhone/Android app that lets you apply retro filters to photos and share them with friends. To use it, users need to sign up first. A few months back, we published an article [How to sign up for instagram online (PC / Computer)] describing the process to sign up from PC. Unfortunately, Instagram made some changes to the website and the process no longer works now. However, there is still another way to sign up and use Instagram from your computer. Unlike the last process, this trick lets users to fool Instagram into thinking that they are using a phone even though it is actually done from a computer. 1. Download and Install BlueStacks. It helps you to set up an environment for running the Instagram app on your computer. 2. 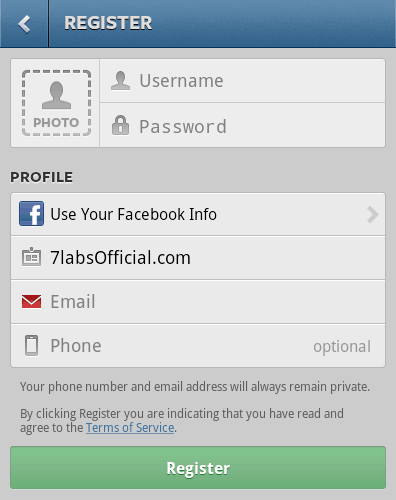 Download the Instagram Android app. 3. Now install the Instagram app in Bluestacks by double clicking the .apk file. BlueStacks will automatically install the app. 4. Start the Bluestacks app launcher and open the Instagram app from your BlueStacks’ library. 5. The app prompts you to sign up the first time you launch the app. Click on the “Register” button and enter the required details. You can optionally import your profile picture from your library or from Facebook. Now you are ready to use Instagram and its applications. same way inside BlueStacks. Doing this will also solve the "Dismiss" Sign Up error. Instagram + Sunglasses = Instaglasses – Filters for Real Life?